Joseph Bardac, Paris; (E. Gimpel & Wildenstein, Paris and New York); inheritance from Estate of Peter A.B. Widener by gift through power of appointment of Joseph E. Widener, Elkins Park, Pennsylvania, after purchase 21 February 1917 by funds of Joseph E. Widener; gift 1942 to NGA. According to René Gimpel, Diary of an Art Dealer, New York, 1966: 7-8, Joseph Bardac, Sigismond Bardac's brother, owned both the Houdon marbles of the Brongniart children (NGA 1942.9.123 and .124) and the terracottas by an imitator of the master. (Seligmann sold the marbles to Widener.) 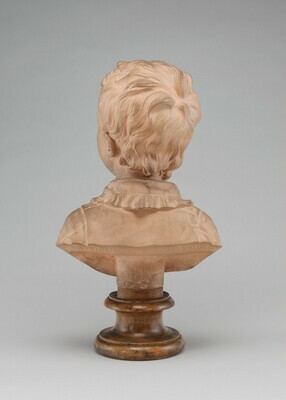 This bust, and its companion, NGA 1942.9.126, were possibly earlier in the possession of Ed. 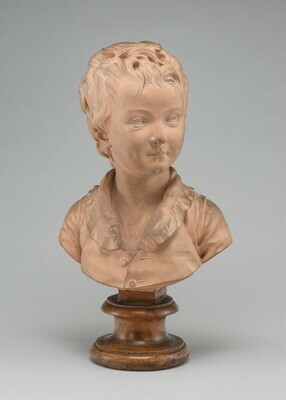 Brongniart, a cousin of Baron Jérome Pichon, the first recorded owner of the marble busts. See information in the Widener card file and catalogue notes, and the notes of both Edith Standen, the Widener collection curator, and Charles Seymour, Jr., about busts by Houdon in the NGA collection, all in NGA curatorial files. Possibly Shapley, Fern Rusk. Early Italian Painting in the National Gallery of Art. Washington, D.C., 1959 (Booklet Number Three in Ten Schools of Painting in the National Gallery of Art, Washington, D.C.): 94 (reference could be to 1942.9.123). Sculpture: An Illustrated Catalogue. National Gallery of Art, Washington, 1994: 111, repro.